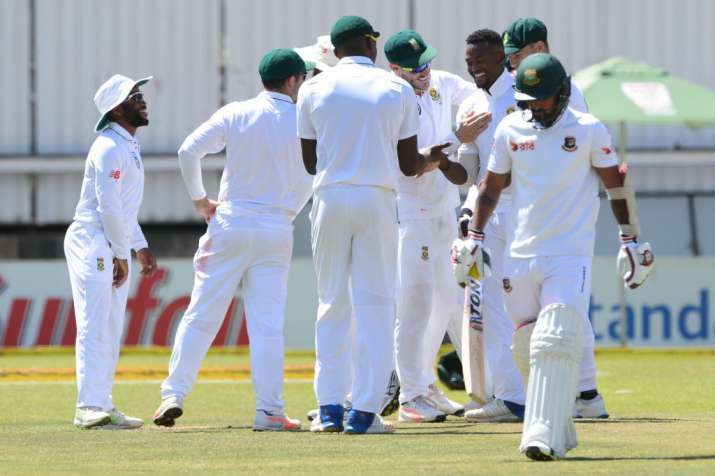 The first-ever four-day Test, to be played between South Africa and Zimbabwe, will be played with the pink-ball and under lights. Image Source : GETTY IMAGES A file image of South Africa players celebrating after a dismissal. The International Cricket Council approved the four-day Tests on a trial basis, effectively giving green light to the Boxing Day Test between hosts South Africa and Zimbabwe from December 26-29. The ICC Board, after its meeting at Auckland, stated that members are free to organise bilateral four-day matches as an experiment till the 2019 World Cup. "Our priority was to develop an international cricket structure that gave context and meaning across international cricket and particularly in the Test arena. This has been delivered and every Test in the new League will be a five-day Test format," said ICC chief executive Dave Richardson referring to the Test Championship that will be played from 2019. "However throughout the discussions about the future of Test cricket it became clear that whilst context is crucial we must also consider alternatives and trial initiatives that may support the future viability of Test cricket. The trial is exactly that, a trial, just in the same way day-night Tests and technology have been trialled by Members. "Four-day Tests will also provide the new Test playing countries with more opportunities to play the longer version of the game against more experienced opponents, which, in turn, will help them to hone their skills and close the gap with the top nine ranked teams," he said further. However, the experiment has attracted criticism from the likes of South African captain Faf du Plessis. He recently said that he remains a fan of five-day games. "I am a fan of five-day Test cricket," du Plessis had said earlier in the month. "I believe the great Test matches have gone to the last hour of the last day on day five. That's what is so special about Test cricket. In four-day cricket or first-class cricket, it does feel easier because there are only four days. "For five days you have to graft it out. Bowlers have to bowl a lot more and batters have to construct much bigger innings." Meanwhile, the ICC Board also approved a revised draft of Player Eligibility Regulations "which will come into effect in due course". "Eligibility on the basis of nationality (residency) has changed to the player needing to reside in the country for a three-year period in both the men's and women's games," said the ICC. Earlier, the player needed to reside in a country for four years to be eligible.